For most of you, the name Zalman will conjure up visions of quiet CPU coolers, and for good reason, they’ve been at the cooler game for many years now. 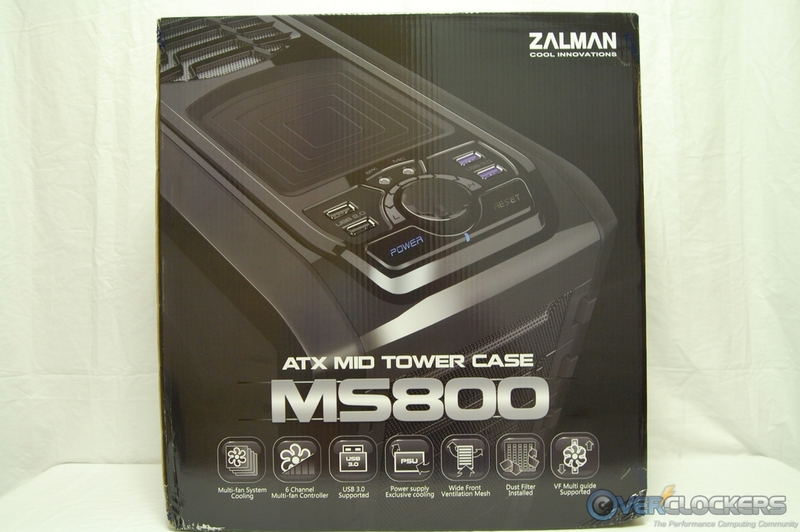 Zalman’s product offerings have blossomed into a wide array of items over the past few years; and today, we’ll be looking at one of their new cases, the MS800 to be exact. 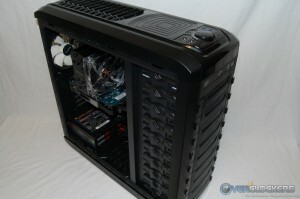 The sub $100 mid-tower case market is saturated with literally hundreds of available options and is one of the most competitive areas of all PC components. 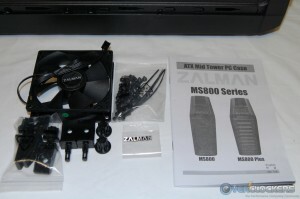 Let’s explore the Zalman MS800 and find out if it has what it takes to separate itself from the competition! 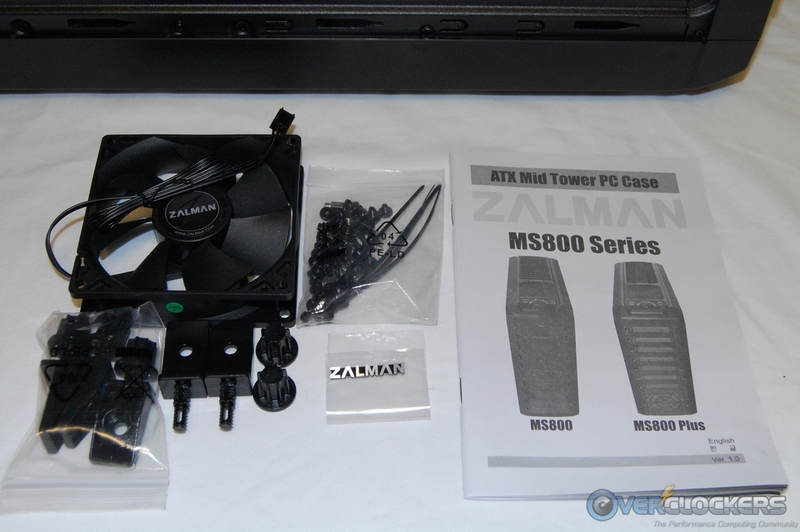 The feature list was plucked and quoted from the product page at Zalman’s website. The table below is a text only version of these features. If you prefer lots of pretty marketing pictures, then follow the link provided. Multi-Fan Cooling System 4/3-FAN structured to cool down the system efficiently (2 addtional fans can be installed). 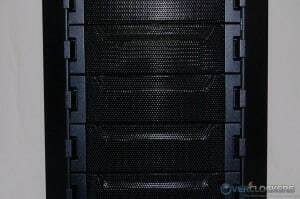 Wide Band Front Mesh Ventilation Structure Maximizes the air flow keeping the HDD and the system cool. 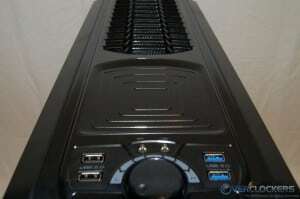 Multi-Fan Controller Provided According to the user needs control fan speed up to 6 fans. Power Supply Exclusive Cooling Supports bottom PSU installation for effective cooling of PSU and inner space of case. User Centered Design Dash board style user-centered design provides style convenience. Dust Block Filter Installed Dust filters on the bottom and front prevent dust from entering. Supports USB 3.0 Ports 2 USB 3.0 port that speed up to 5 Gbps. Tool-Free ODD Bay One touch tool-free ODD bay for easy and quick installation. Convenient Front Interface USB ports, audio socket, power and reset buttons set on the front for user convenience. Connect to Smart Phone or External HDD Place smart phone, external hard drive on the stand next to the USB port for convenient charging and connection. 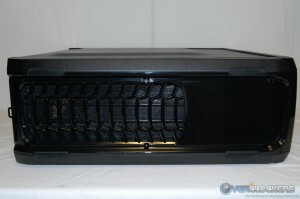 Black Coating Chassis Luxurious interior with black coating finishing touch. 3-in-1 Adapter Tray Provided 3-in1 Adapter Tray is provided for installing FDD / 3.5″ HDD / 2.5″ HDD/SSD. 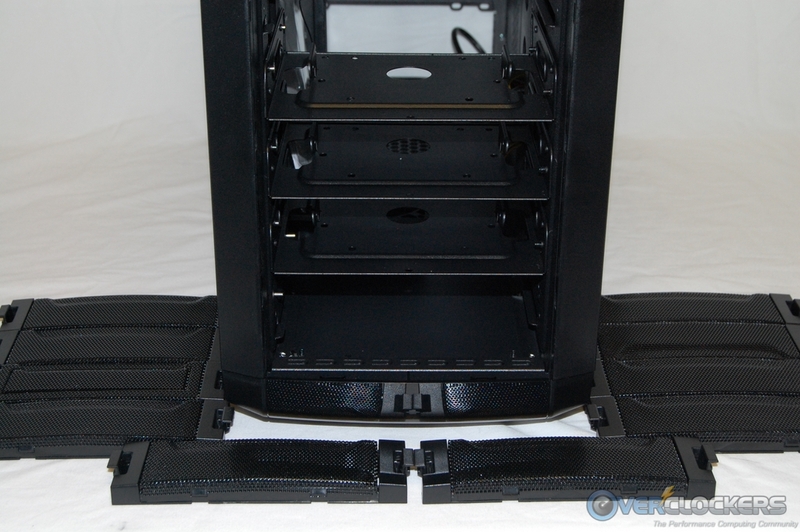 Tubing Apertures for Liquid Cooling Systems Tube apertures are provided at the rear of the case for convenient water cooling set-up and maintenance. VF (VGA/Fan) Multi-Guide Provided Multi-Guide provided to prevent VGA from bending and for installation for additional fans. 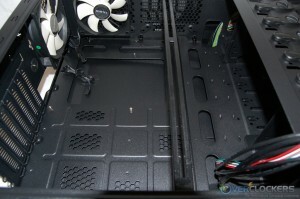 Spacious Interior Space Without the side guide 300 mm high performance VGA card can be installed. HDD Module Design Module design for convenient installation of SSD and HDD. 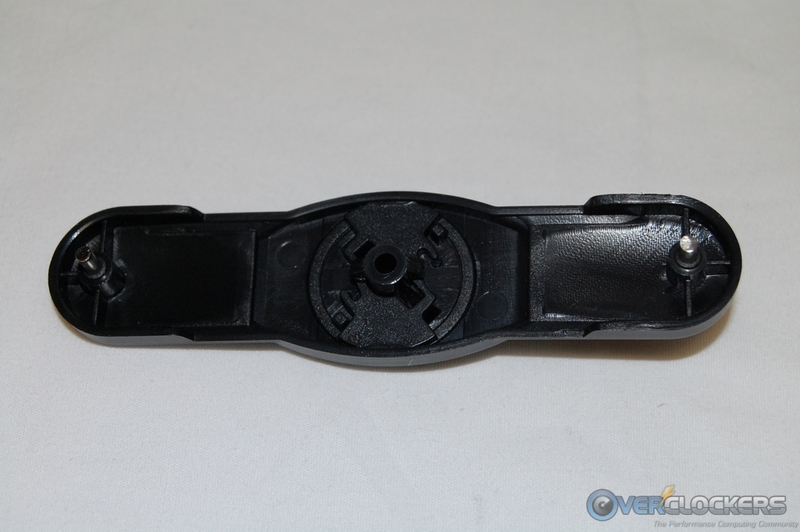 Front Detachable Tool-Free ODD Bay Front detachable Tool Free ODD bay for convenient installation. 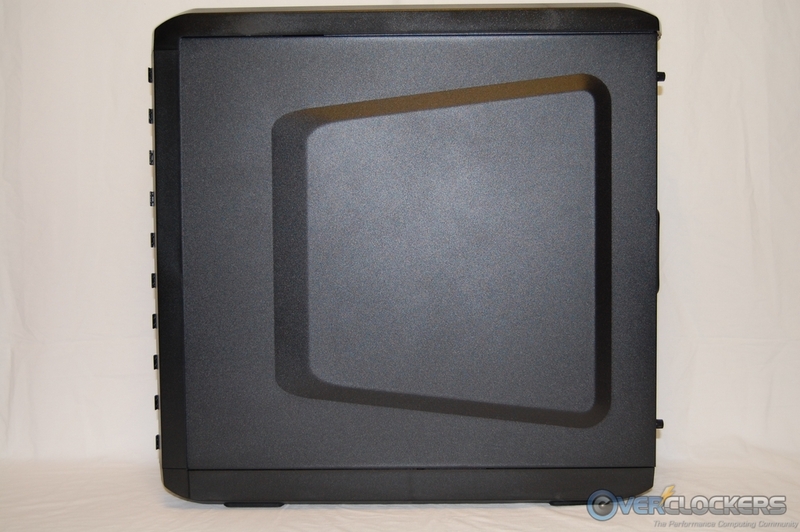 Anti-Vibration and Noise Absorption Rubber Anti-slip rubber at the bottom of the case and the PSU helps to eliminate vibration sound. 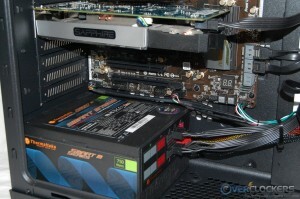 PCI Slot Scalability Secured Up to 7 PCI slots scalability secured. 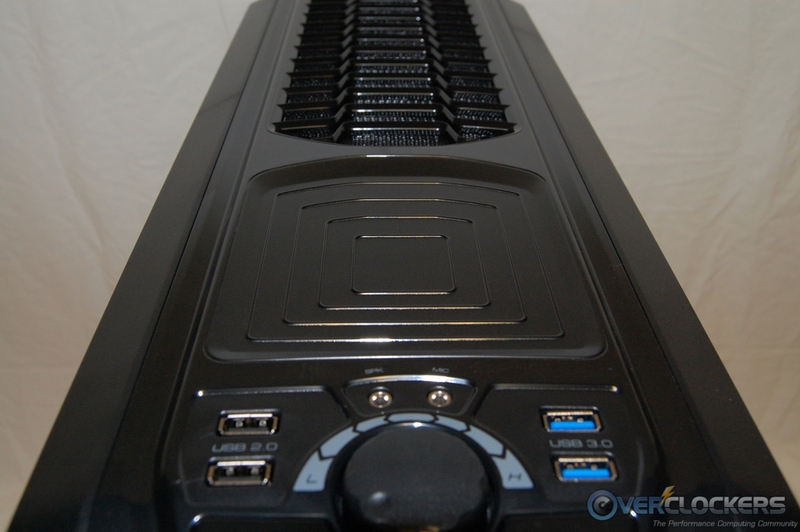 The specifications show lots of drive bays, a fan controller, and a fully equipped front panel. 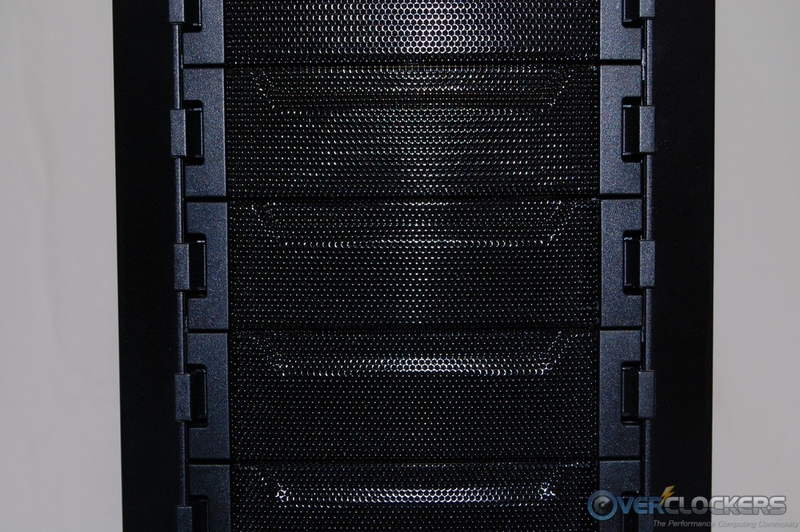 I’m not quite sure who would need six 5.25″ drive bays, but we’ll reserve judgement until we get inside the MS800. 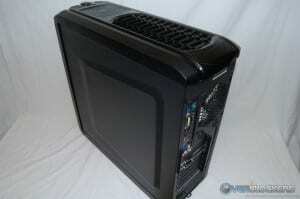 Again, the specifications are quoted from the Zalman website. The nice looking, black themed box makes a point of bringing the front panel “Dash Board” design to the forefront. The pictures on the front and back make sure of that. The box front does show several icon feature descriptors, whereas the back of the box is dominated by an alternate view of the “Dash Board”. The box sides are outfitted with a basic multilingual list of features on one side and the specifications on the other. There isn’t anything printed on the box that isn’t listed above, so don’t squint your eyes trying to read it! 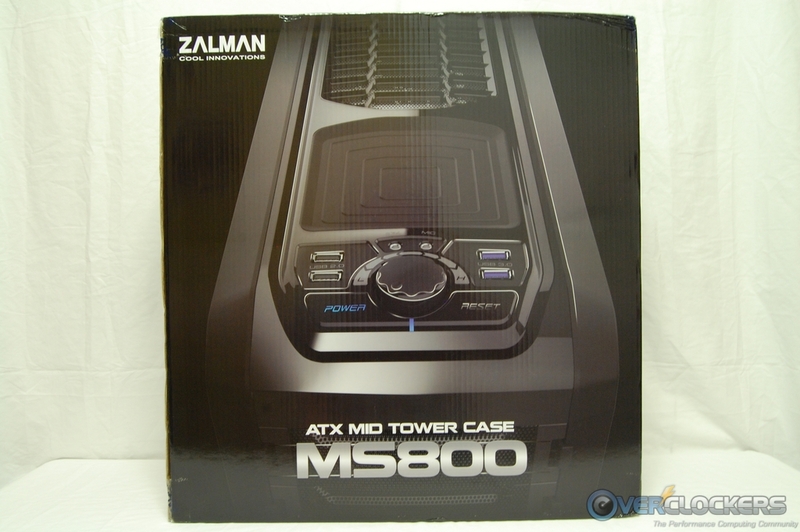 The box top is reserved for noting the model of the case and additional Zalman branding. Inside, we see the omnipresent Styrofoam blocks protecting the MS800 from the shipping thugs. The MS800 is also nicely wrapped in a plastic bag with the appropriate warnings of keeping children away! Not from the case… the bag, silly! Let’s get this thing unpacked and have a look around! 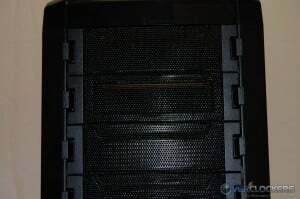 The two side panels are identical and have a large bulged out center area. 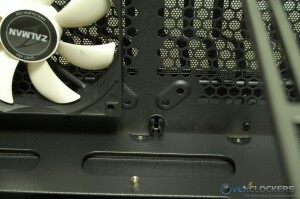 Both of the side panels are held in place with two thumb screws. 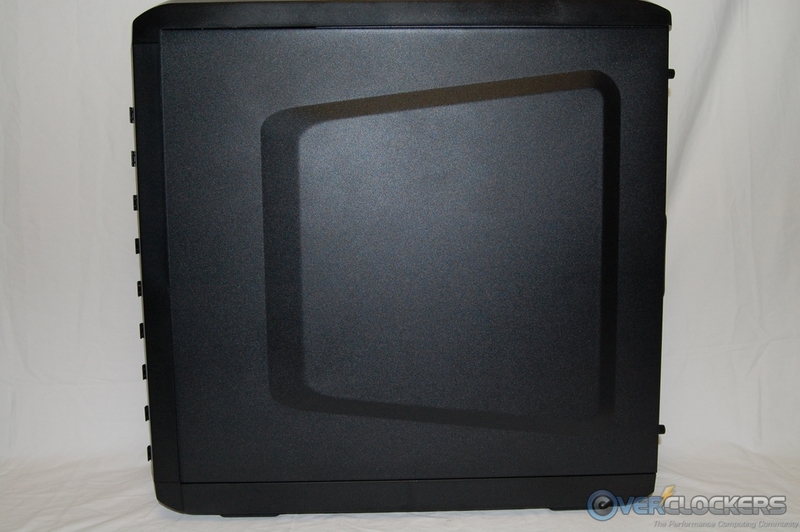 The rear of the MS800 has a bottom mount PSU area, seven ventilated expansion slot covers, and the cut out for the motherboard’s I/O shield. 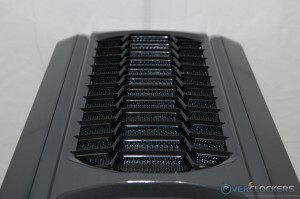 Zalman also includes a 120 mm exhaust fan and two rubber protected holes for a water cooling system’s hoses. 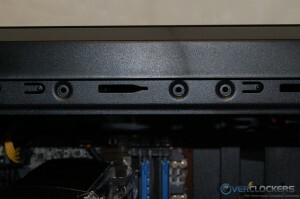 The PCI expansion slots have their mounting screws located outside of the case. 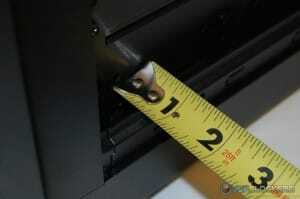 This provides easier access than the traditional method of having them located inside the case. 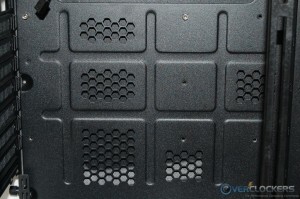 There is a cover plate that goes over the area to keep things looking good. 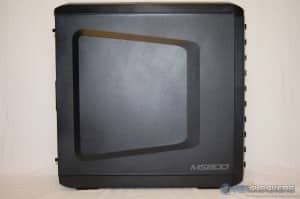 The front of the MS800 is comprised entirely of removable mesh bay covers, all of which have a foam type filter applied to the back side. Noticeably missing is any sign of a front intake fan. Interesting design choice there, but we’ll see how it pans out once we get a look inside. 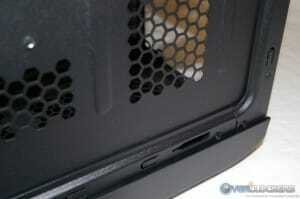 The bay covers are simple to remove by just pinching inward on the two tabs at each end of them. 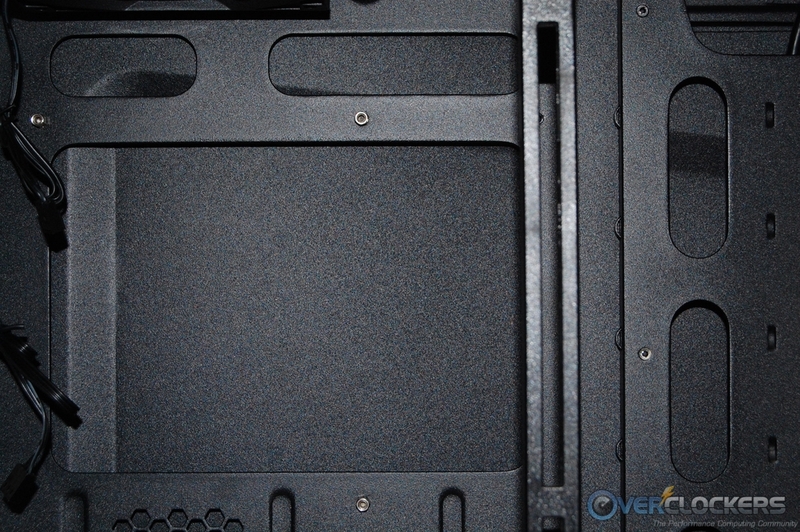 After all of the bay covers are removed, you have an open path for viewing where the drives get installed. All Mesh Bay Covers, All The Time! Top Bay Covers, Look Familiar? The top panel area is where the Dash Board Control Panel makes itself known. 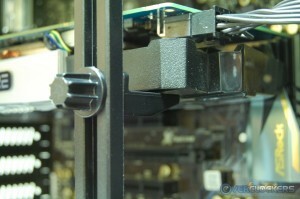 The large knob in the center is used for controlling up to six fans. Turn it to the left to slow fan speeds down and to the right to speed them up. Just in front of the fan control knob are the power and reset buttons, and right behind the knob are the headphone and MIC jacks. 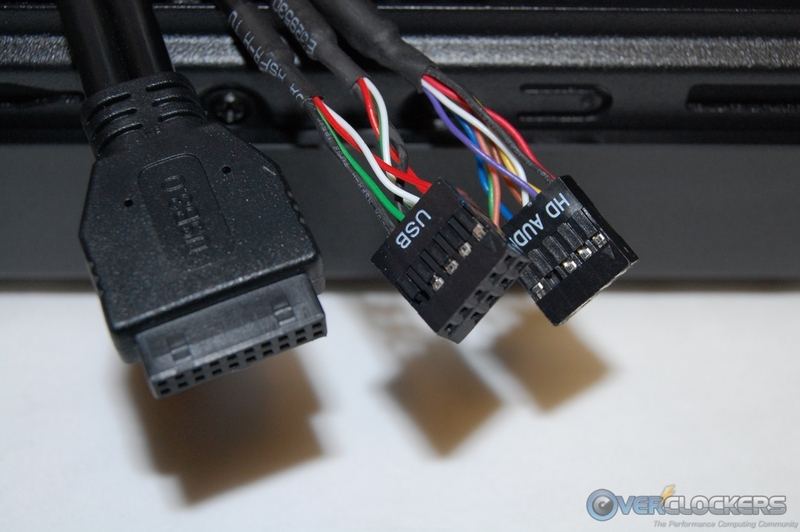 Rounding out the Dash Board are two USB 2.0 and two USB 3.0 Ports. Just behind the Dash Board is an area designed to rest devices for charging or data transfer (think smart phone or external HDD). Zalman calls this area a “stand”. 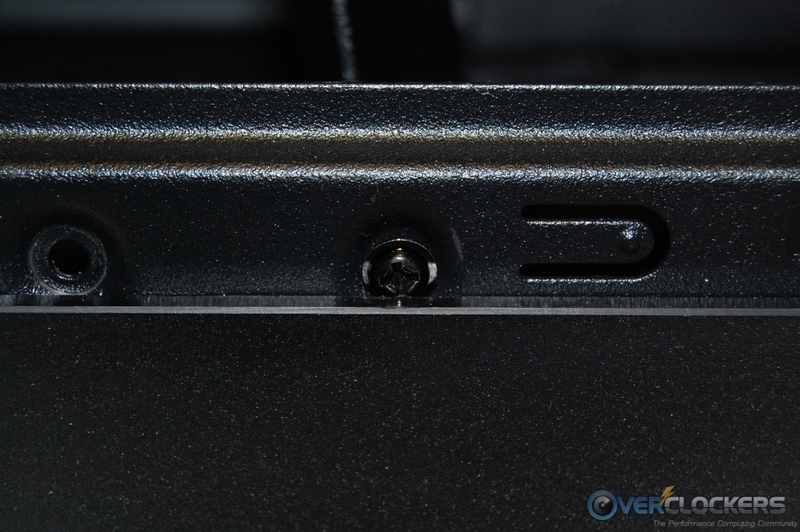 In reality, it’s a recessed area with grooves that actually do very little, if anything at all, to secure a device resting on it. 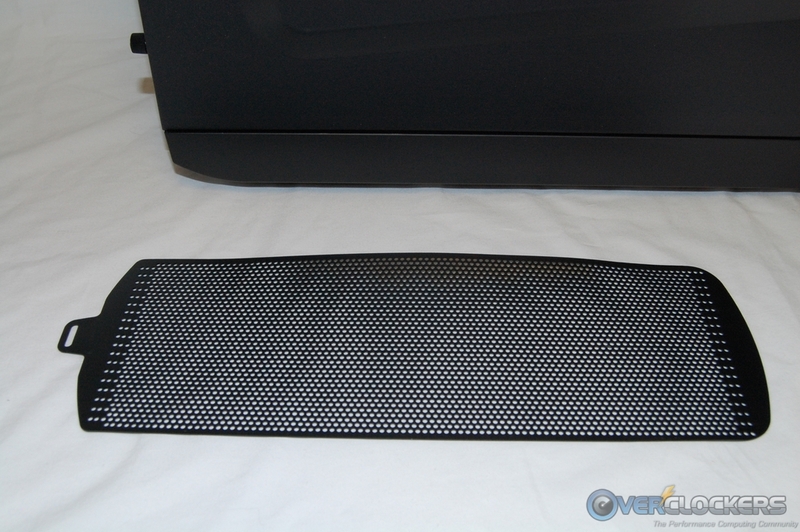 The rear portion of the top panel has another meshed area with included 120 mm fan below. 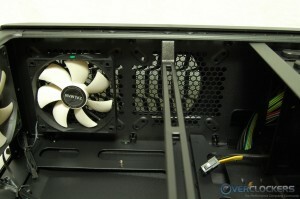 An optional 120 mm fan can be installed here as well. The bottom four feet have nicely applied rubber strips to help from scratching the surface the case sits on. 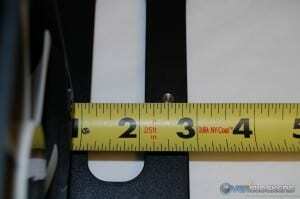 The rubber strips should also help minimize noise associated with any potential vibrations. 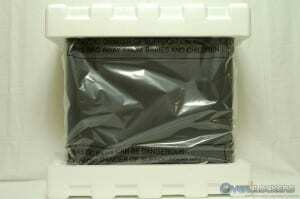 The filter is made completely of plastic and slides out from the rear. The filter is a rather flimsy ordeal that will require you to “guide” the front with one hand as you slide it back in place with the other hand. The filter is also pretty grainy, and definitely not what I’d call a fine mesh filter. 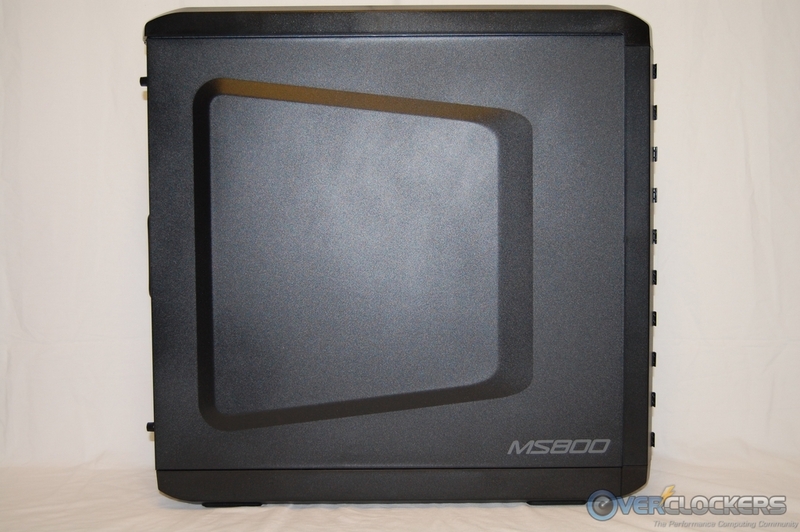 Now that we have a good feel for the external looks and functionality, let’s open up the MS800 and have a look inside! 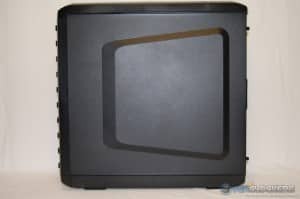 Up to this point, I was hearing items rattling around inside the case, and I resisted the urge to remove a side panel for inspection. Once I removed the left side panel, I found the accessories scattered about the interior. It’s hard to say exactly what method was used to package the accessories, but there was a large plastic bag (which was torn) and a wire tie that appeared to fail holding whatever it was supposed to. At any rate, I gathered everything up so you can see the included accessories. Not pictured is the 8-pin CPU AUX12V extension cable, which I later found hiding at the top of the 5.25″ drive bay area. With the left side panel off and the accessory mess cleaned up, we get a glimpse of the layout the interior has to offer. 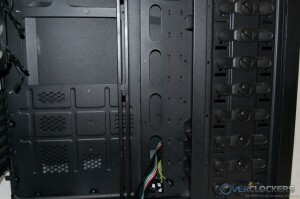 Beginning at the bottom, we see lots of ventilation holes and rubber strips for the power supply to rest on. 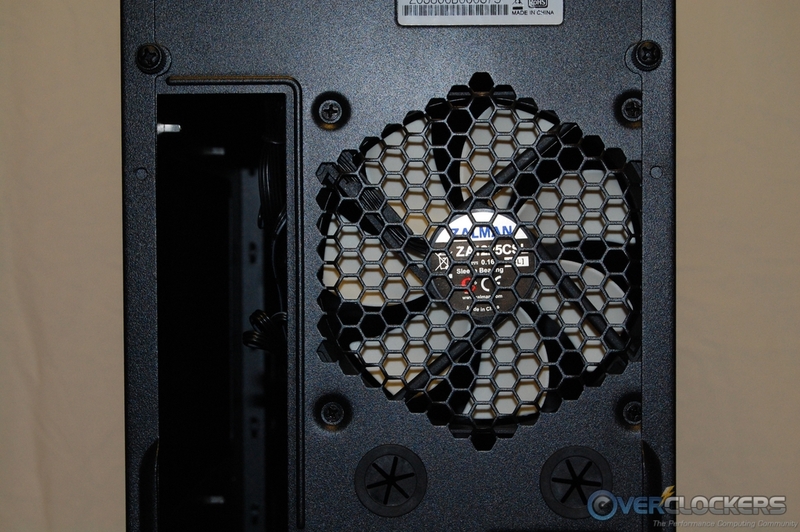 Also of note is the ability to add an optional 120 mm or 140 mm fan. The rail you see in the picture below is what Zalman calls a “Multi-Rail”. It’s used to help support video cards and can also be used as an additional location to install a fan. I’ll explain this in greater detail later in the review. 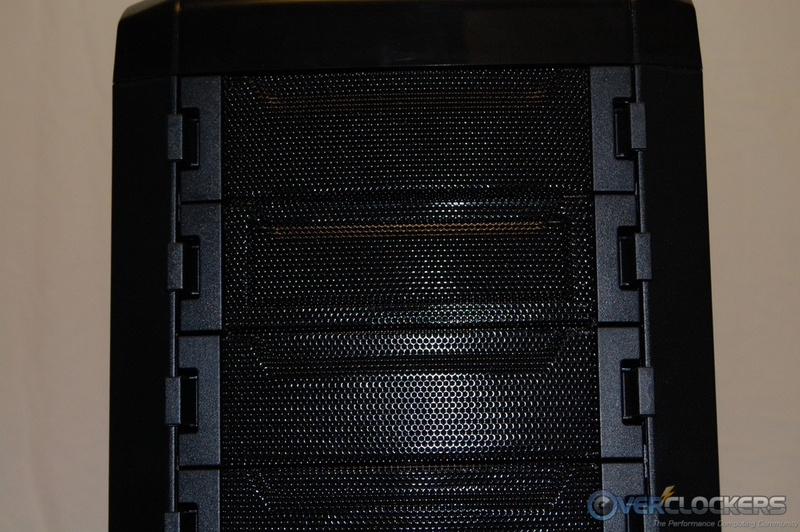 Moving up the back of the MS800, we see the seven ventilated PCI slot covers and a Zalman branded 120 mm exhaust fan. 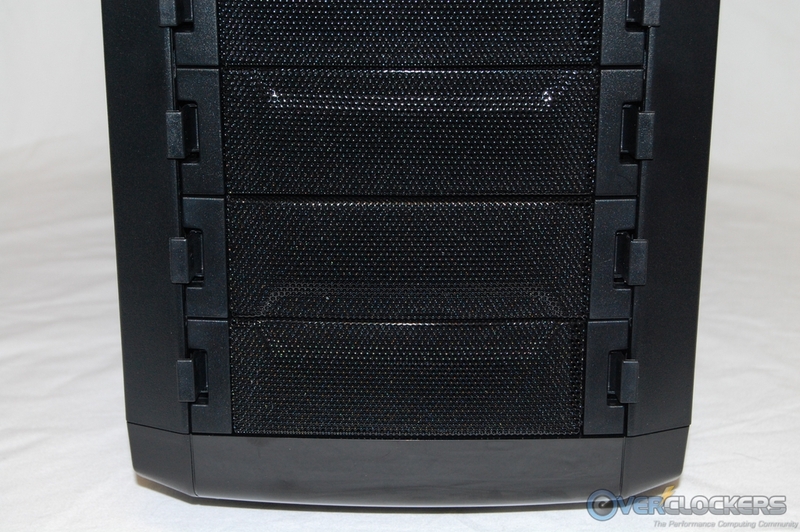 Under the top deck there is another included 120 mm fan. 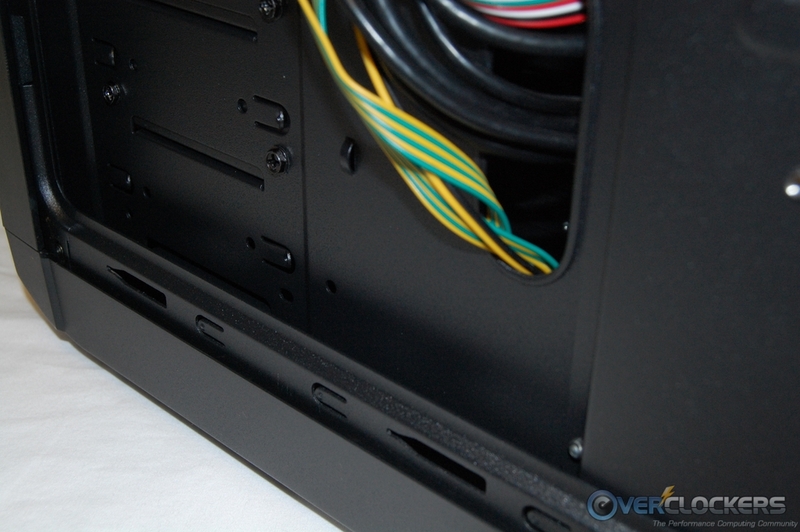 The design incorporated here allows for installing up to two 120 mm or 140 mm fans. 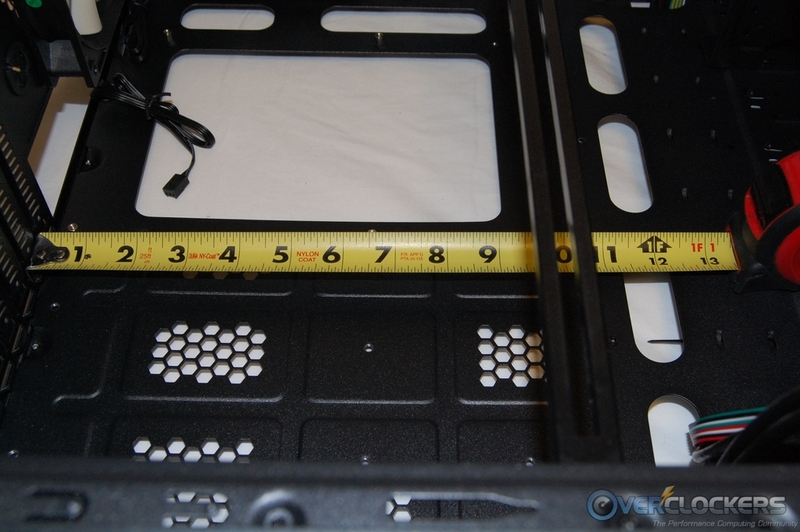 There is right about 60 mm in space between the top deck and the edge of the motherboard. 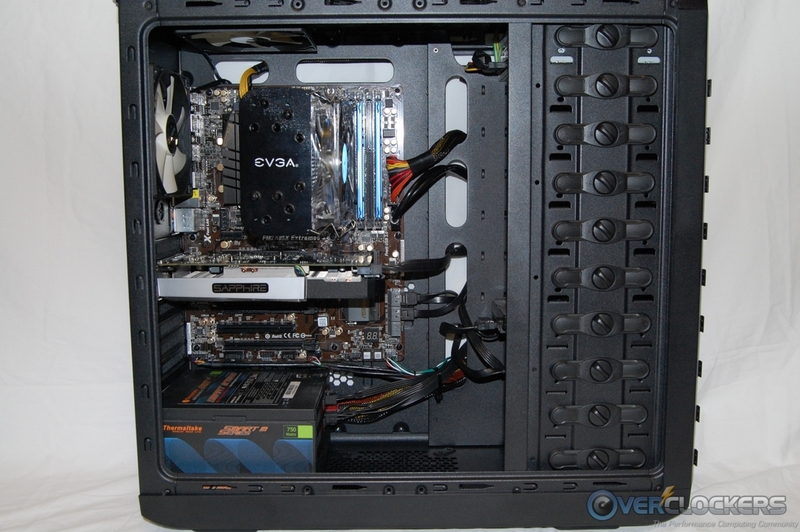 However, if you have ideas of installing a dual radiator or all-in-one water cooling solution here, forget it. The problem being the fan spacing is way too wide to accept a 240 mm or 280 mm radiator/fan setup. This is a huge missed opportunity, especially given there is plenty of room under the top deck to accommodate such a setup. Only single fan water cooling radiators need apply. 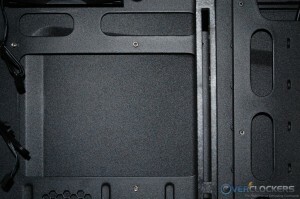 Moving around to the front area, we find ten usable drive bays, even though the specifications say there are only nine. 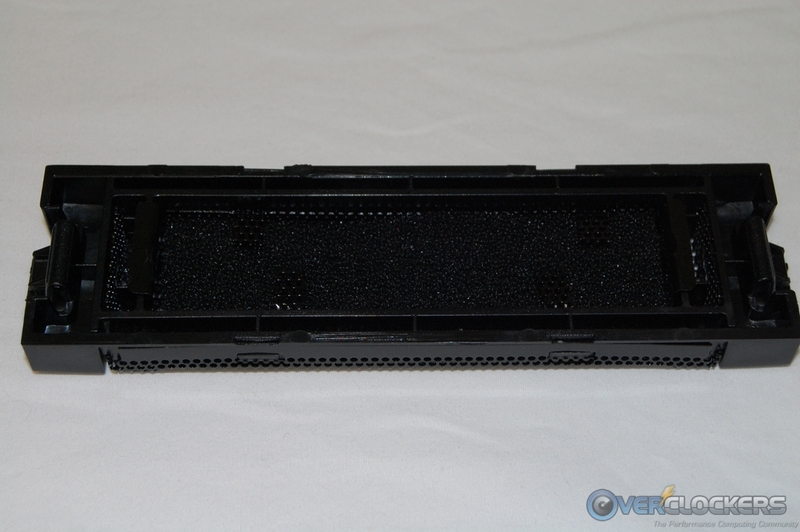 The specifications also say there are three 3.5″ trays and one common 2.5″/3.5″/5.25″ tray. I looked at all four of the included trays and they are identical. 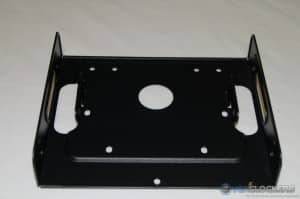 I think the point they are trying to make is that one of the drive bay covers has a removable center portion to accommodate a 3.5″ external drive, such as a floppy drive or card reader. 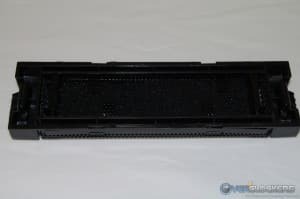 Basically, there are four removable trays that can be installed in any of the ten bays, thus allowing you to customize your storage drive locations. 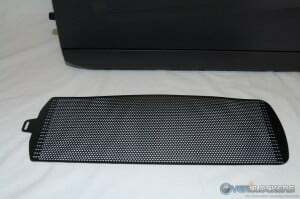 I like the fact these trays are made of metal, and not the flimsy plastic kind found on many other cases. As a side note, both traditional 3.5″ HDDs and SSDs are secured to the drive trays using the bottom holes on the drive. 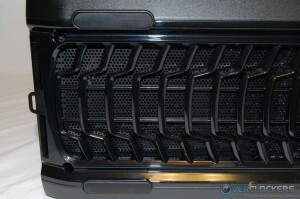 As I mentioned earlier, there is no front intake fan, nor is there an option to install one. 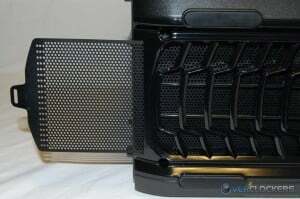 I doubt the two included 120 mm fans will produce enough power to draw air through the front of the case, or at least not enough to provide much cooling to the drive bays. 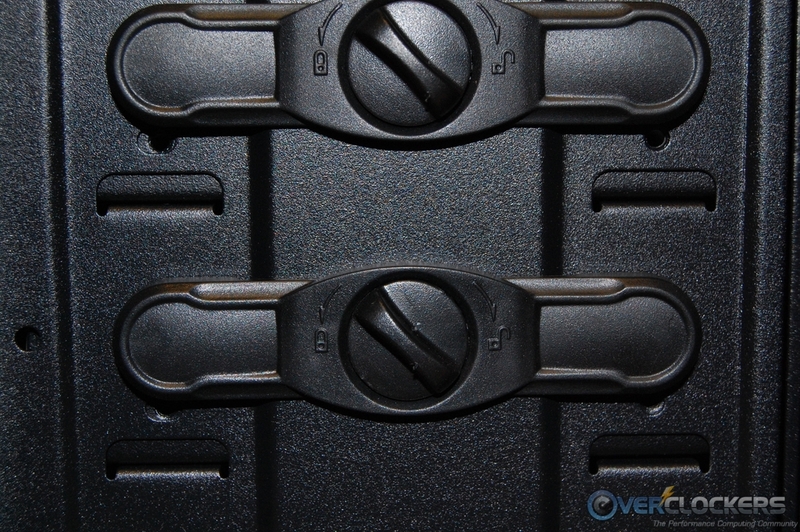 The locking latches work very well and only require turning the center knob to lock or unlock them. 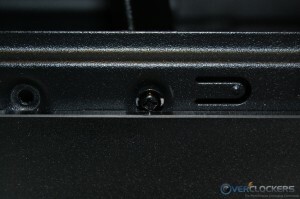 The two pins on the back of the latches align with the appropriate holes on the drive to be installed. 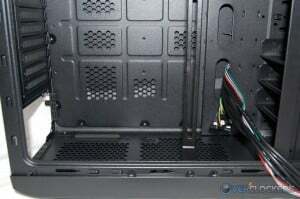 A closer inspection of the motherboard tray area shows a unique way of implementing cable management. 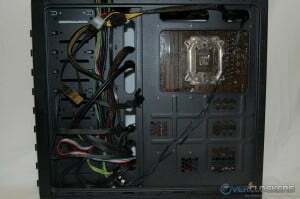 Missing from this design is a horizontal cable routing hole, usually found just forward of the PSU. 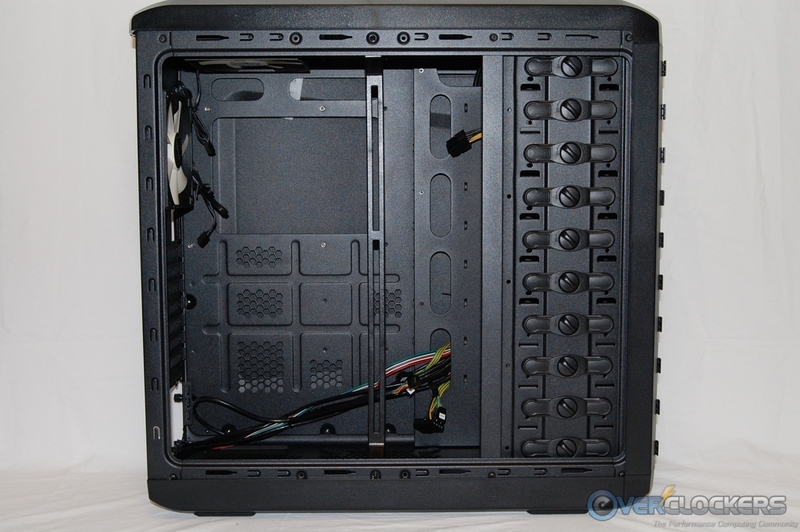 Instead, all four cable routing holes are in a vertical position on the right side of the motherboard tray. 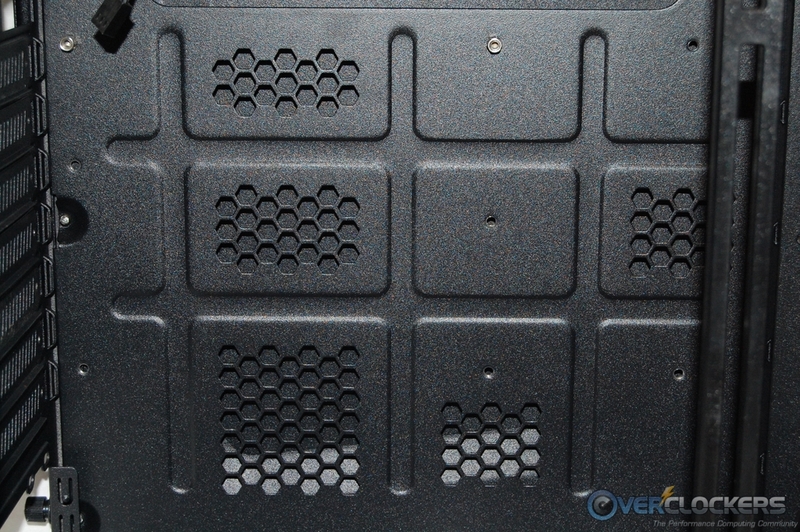 When we look at the back of the motherboard tray, you’ll see how this design is intended to work. None of the cable routing holes have rubber grommets, but the edges are rounded enough as not to cause any damage to wires. 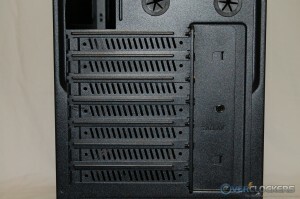 There is a series of ventilation holes cut into the motherboard tray’s lower half. I’m at a loss to figure out what good these holes do, but there they are none the less. The motherboard tray has a large cut out for accessing a CPU cooler’s backplate, and just above that are two more cable routing holes. For video card installation, I measured just under 12 inches of available room, which coincides with Zalman’s claim of 300 mm. 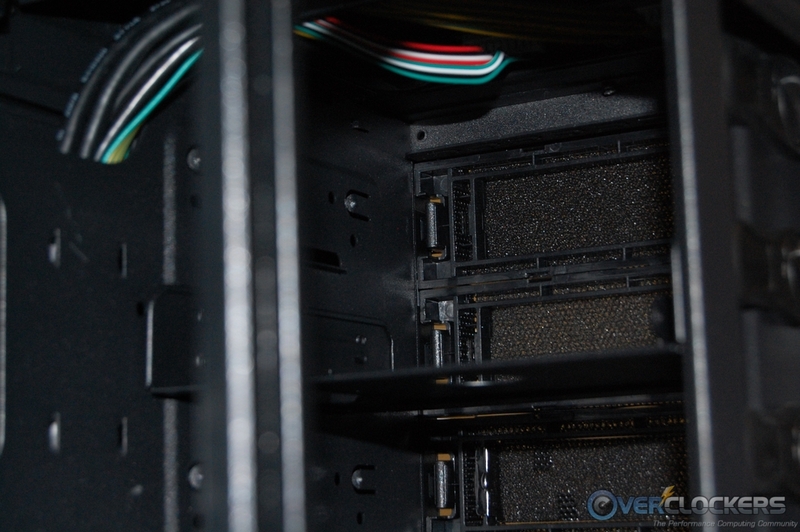 Once I got a look at the back side of the MS800, the cable management plan began to come clear. 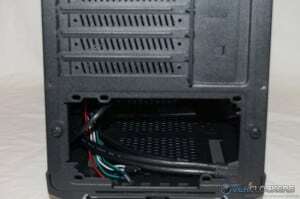 All of the room to hide cables is on the forward half, behind the cable routing holes and drive bays. I measured just under an inch of room here. I’m not sure how well this is going to work out, but initial impressions indicate using a modular power supply would be a wise choice. 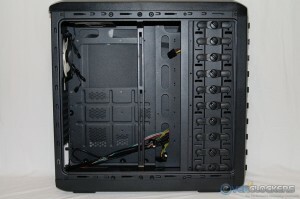 Other than the room the bulged area on the side panel provides, there is little room directly behind the motherboard tray and the right side panel. We’ll see how all this plays out when I throw a system together. 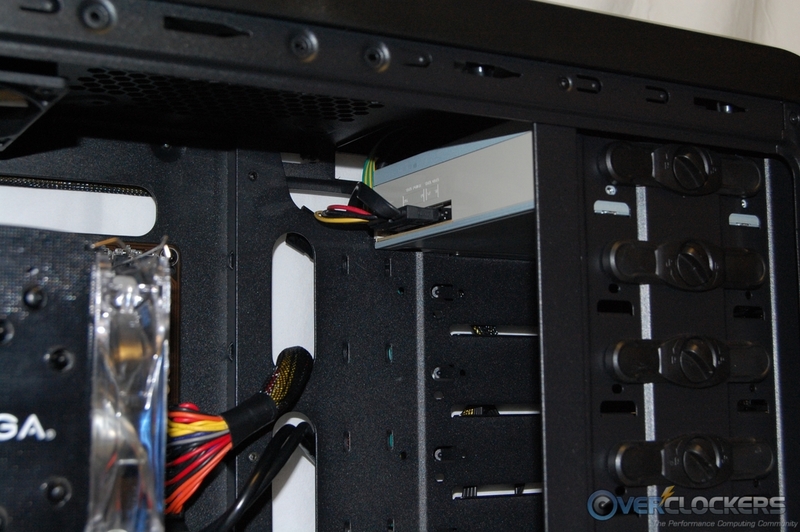 The case wiring is standard fare for cases offering front panel USB 3.0 ports. 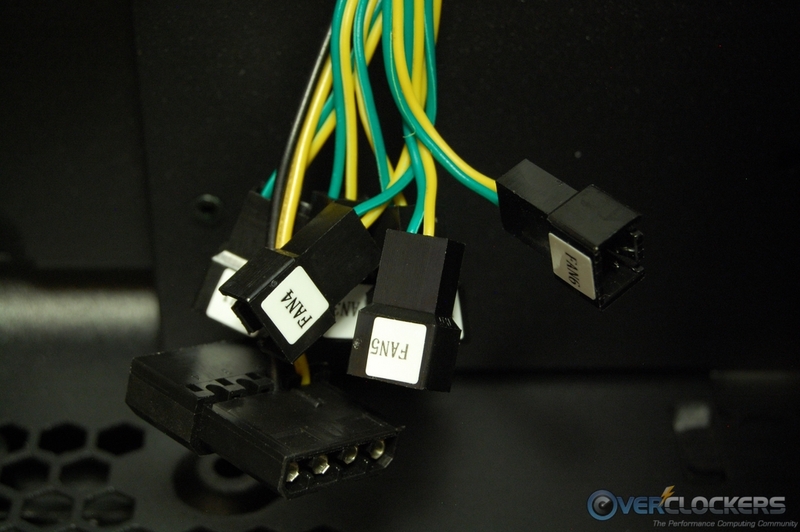 Additionally, there are six fan connector cables for use with the fan controller. 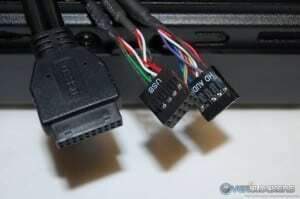 The fan controller is powered by a 4-pin Molex connector. 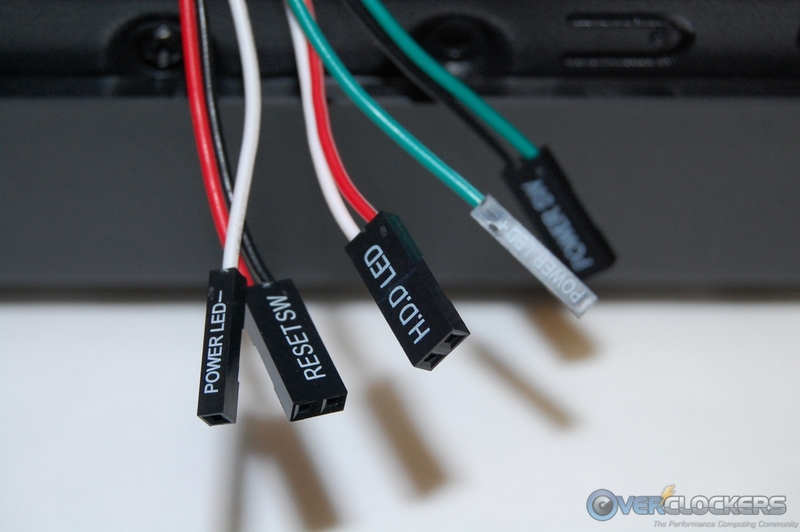 I would have much preferred to see a SATA power connector to power the fan controller, especially with other SATA devices more than likely being close by. It’s time to assemble a system in the MS800 and see how well we can utilize the unique cable management! Because you are limited to using the forward section of the back of the case for hiding wires, it was definitely a challenge trying to get a respectable looking system. As you can see by the component list above, I assembled a pretty minimalistic system in the MS800. 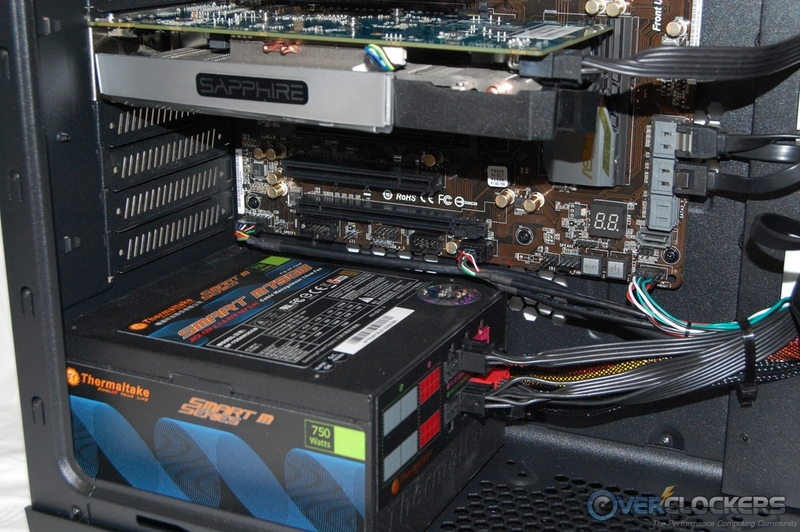 I can only imagine how difficult it would be to assemble a system with a non-modular PSU, several HDDs, SLI/Crossfire, and maybe a couple optical drives. Don’t get me wrong here, it can be done, but the mass of cables that type of system needs will stretch the cable management this case offers beyond its limits. 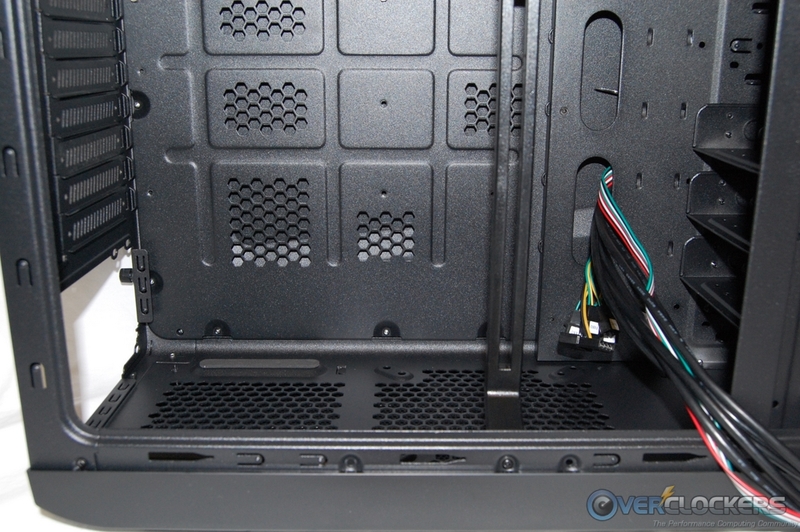 As long as you’re able to keep the cables tucked away in the forward section, getting the right side panel back on is easy to do. 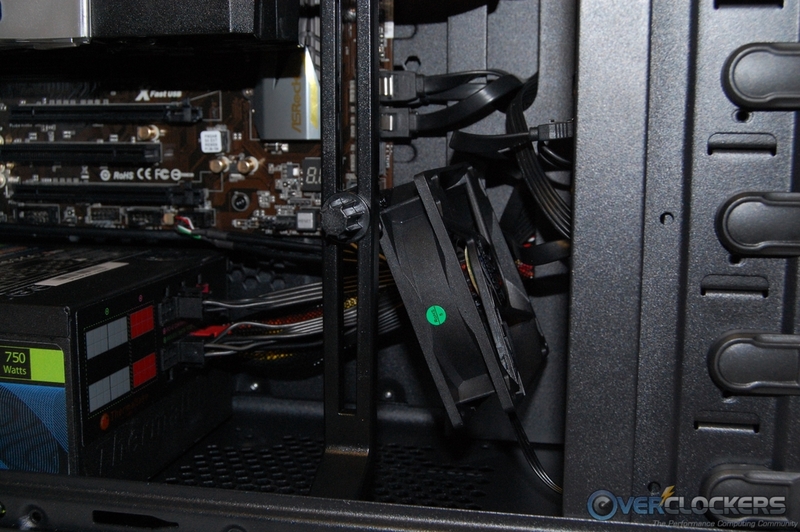 Anyway, I was able to get a fairly decent looking build together… Enjoy the pictures! As promised, I wanted to touch on the Multi-Guide feature I mentioned earlier. 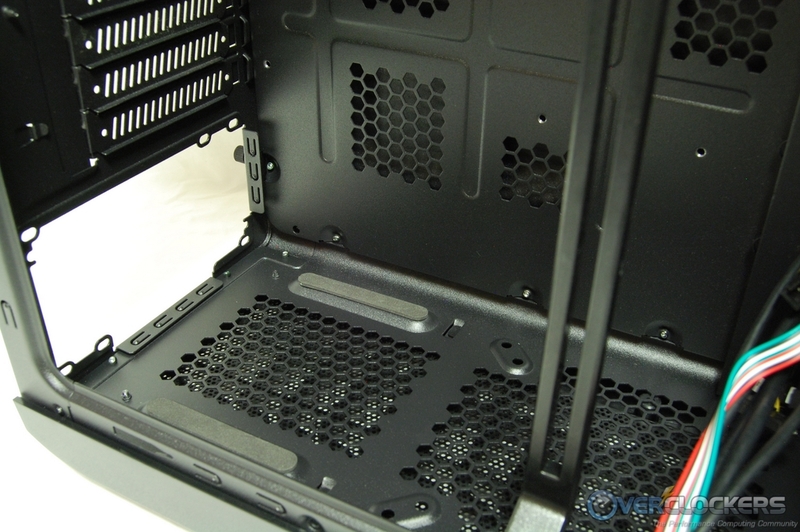 There are three holes at the top and bottom of the case’s frame where you attach each end of the rail. The design allows for installing the rail in three different positions. If you have a PSU with any length at all to it, forget about using the rearmost position because the PSU will block the rail’s access to the lower mounting hole. 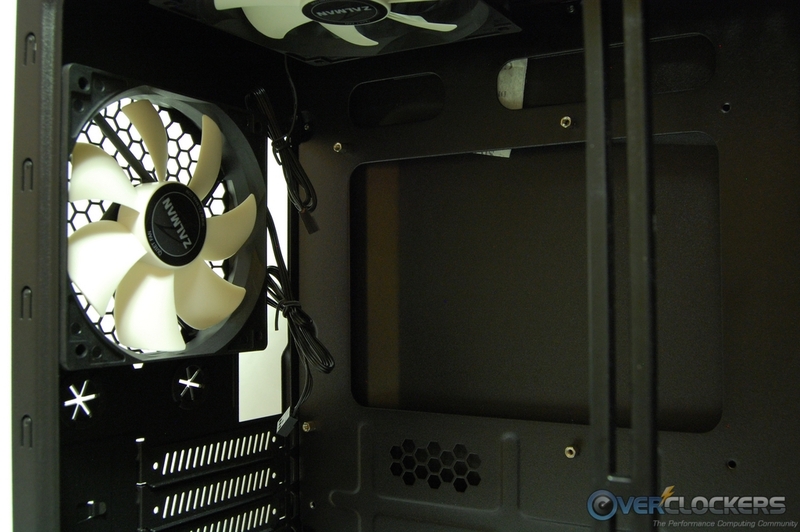 The Thermaltake 750 Watt Smart-M PSU I used in this build is not what anyone would consider a long PSU, but yet it still blocks the rearmost hole for mounting the rail. Another annoyance is trying to remove the bottom screw. It seems the outside casing covers part of the screw head, and you have to fish it out with a very small screw driver once it’s released from the rail. The hole I needed to use for supporting the HD 7770 I installed was, of course, the one being blocked by the power supply. To give you a visual of how it’s supposed to work, I held it in place and took a picture of the support arm doing its thing. It’s a pretty cool feature actually; too bad it won’t work for shorter video cards with an average size PSU. In addition to being able to support video cards, the Multi-Guide can also be used to mount fans on. The accessories are packaged with a 92 mm fan for just this purpose. 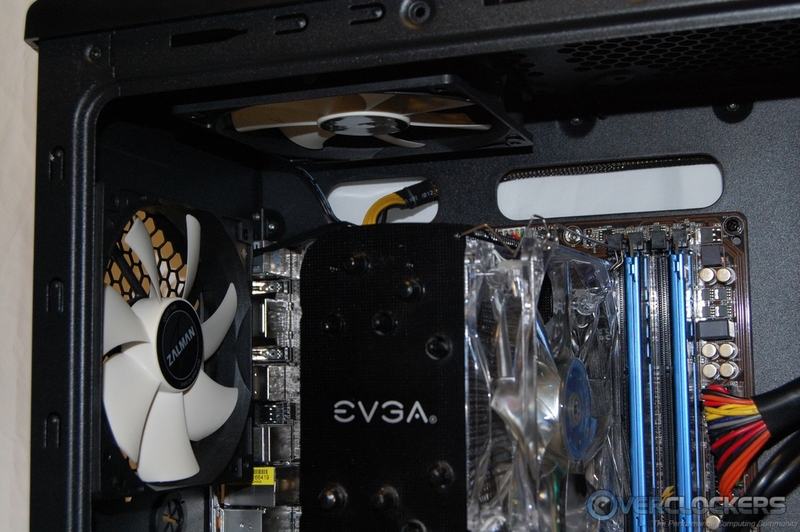 There’s no reason why you can’t customize the Multi-Guide to support a video card and hold a fan at the same time, or even two fans if desired. I mounted a fan to the rail to give you an idea how it can be used. 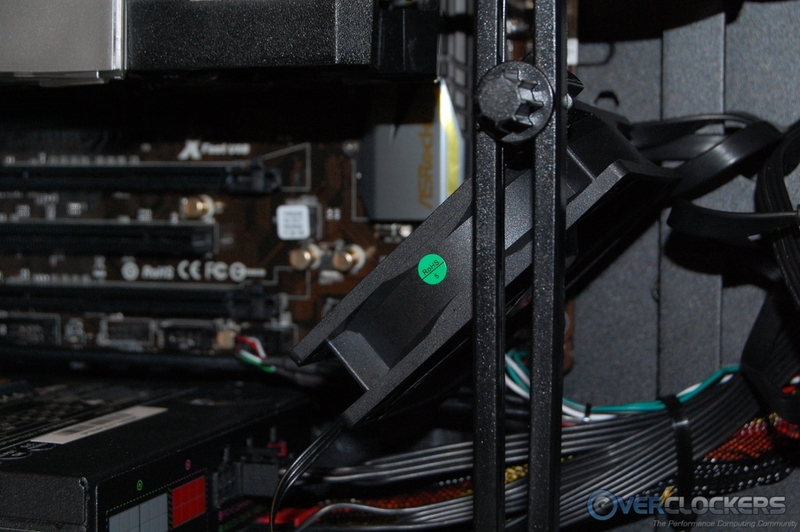 If you use just one of the mounts, you can tilt a fan and point it at a particular component, most likely the HDDs or video card. When I think about this case after spending a couple of days with it, two words come to mind – missed opportunities. The concept behind the MS800 is actually pretty unique, but unfortunately the implementation lacks in a few areas. The enthusiast crowd will no doubt cringe when they see all the available space they need to install a 240 mm or 280 mm radiator under the top deck, only to have the idea thwarted by non-standard fan spacing. I really like the idea behind the Multi-Guide rail system, but it too could use some refinement. 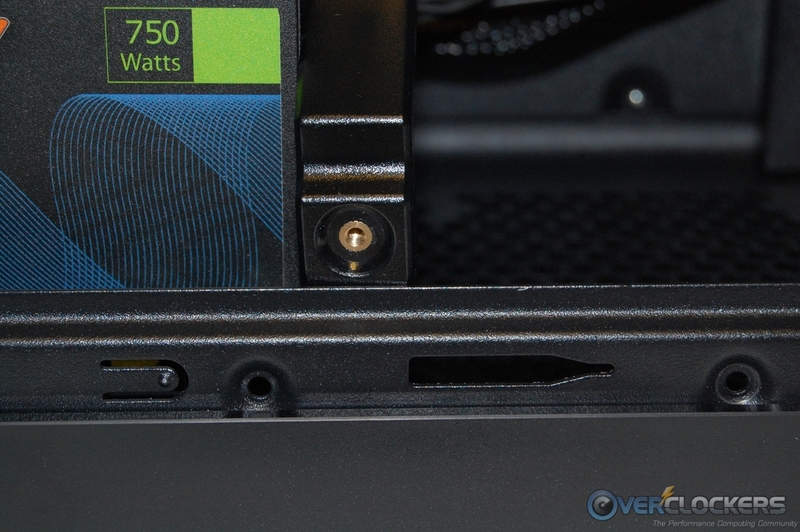 They could fix the PSU clearance issue by moving the rearmost mounting hole forward just a little; or the best solution might be to just move the curve built into the rail higher up, so it would clear the body of the PSU. 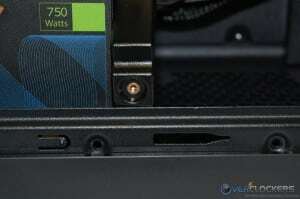 If the curve was higher up the rail, the length of any PSU would be irrelevant. Cable management for simplistic system builds is fine. 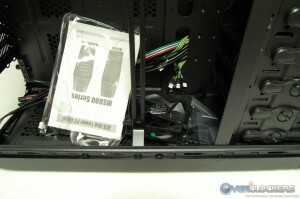 Where you’ll begin to run into problems is if you pack the case with a lot of components. 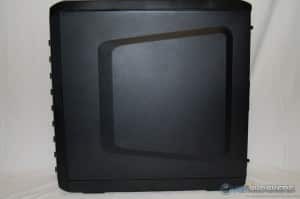 If there was as much room across the entire back of the case as there is at the forward area, you could really build a monster system in this case. 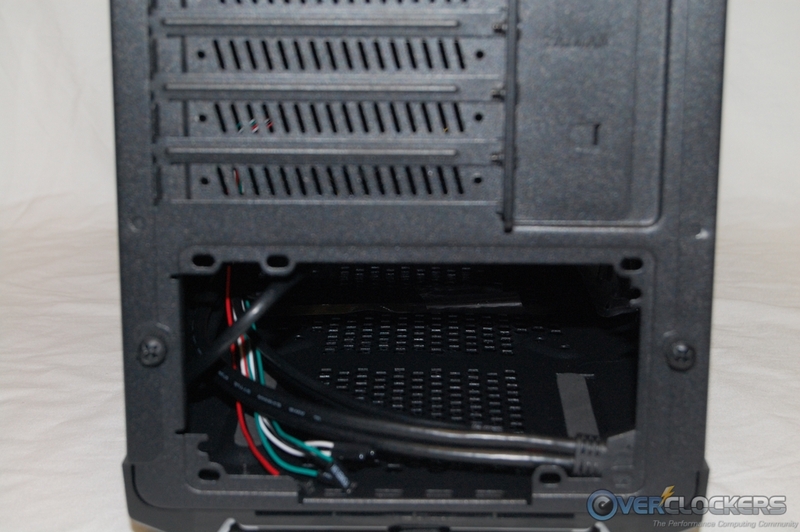 I also found myself missing the horizontal cable routing hole most other cases have just forward of the PSU. However, with the almost non-existent space between the side panel and where such a hole would be located, I can understand why it was omitted. 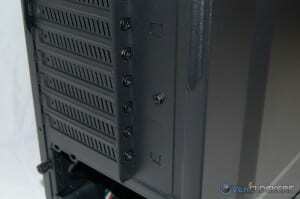 It would be nice to see the cable routing holes that are supplied outfitted with rubber grommets. One other thing I believe the enthusiast crowd will frown upon is the lack of a front intake fan, or at least the option to install one. 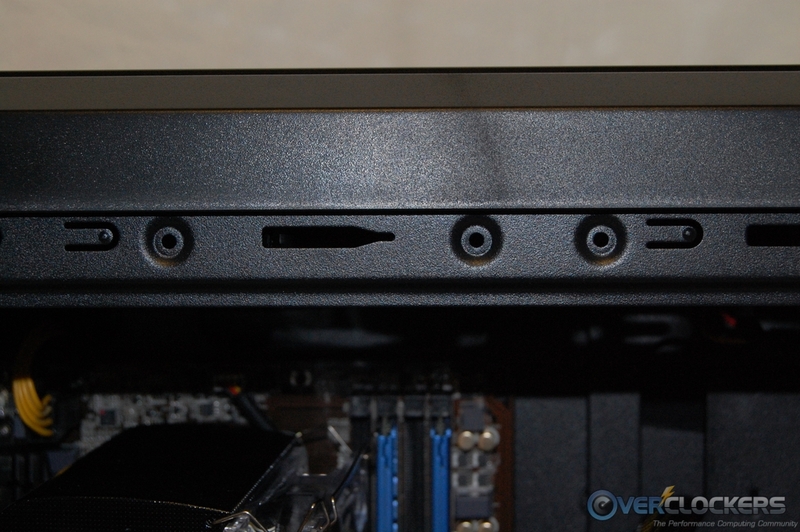 With ten usable drive bays, surely there is a way to provide a bracket of some sort that a fan can be mounted to. Even with the shortcomings above, there are still some very nice attributes the MS800 offers. 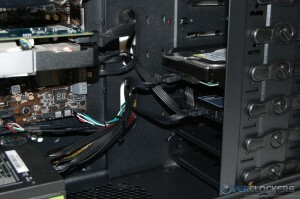 I like the ten usable drive bays and how they allow for customizing your storage needs in just about any manner. The drive trays are metal, sturdy, and accept any size drive. If you have a longer video card that needs supporting further back than the one I used, then you’ll enjoy the Multi-Guide rail system. The ability to add a fan to the rail is an added bonus. The Dash Board Control Panel is a very attractive and functional addition to the MS800. I like having the ability to control up to six fans with it, nice feature there! 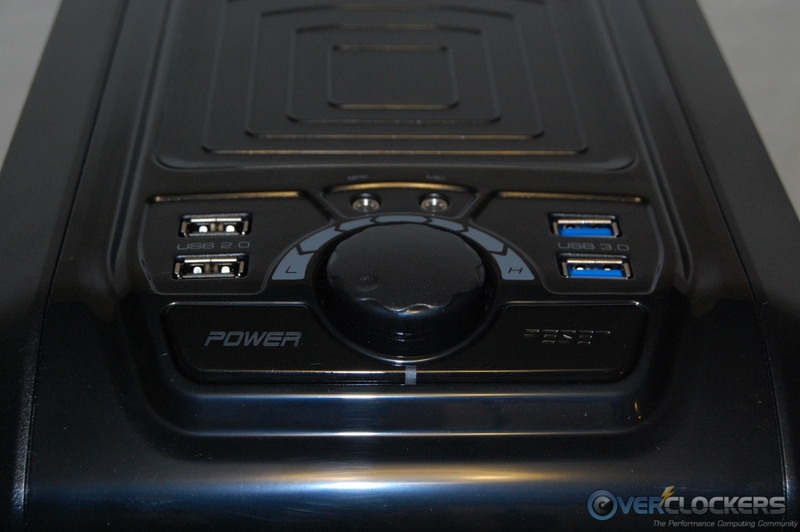 Having four USB ports at your disposal is always a plus, especially when two of them are USB 3.0. As I mentioned at the very top of this review, the sub $100 dollar case market is extremely competitive. 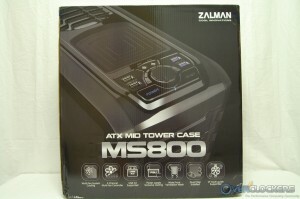 Currently, the Zalman MS800 is selling for $89.99 at Newegg, which lands it in a crowd of attractive offerings. 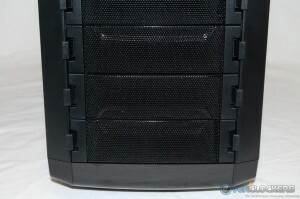 There are a couple Lian-Li cases in that price group (PC-A55B & PC-7HX) and the Corsair Carbide 300R. If you take shipping into account, then there are several more cases you can include in the group of competitors, including the Cooler Master HAF 922. 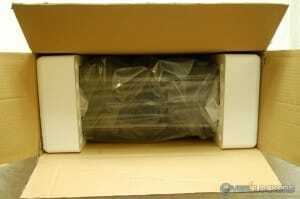 Many others come with free shipping, whereas the MS800 has $15.00 tacked on to the price. This is of course subject to change at any time. I think if Zalman is able to refine some of the missed opportunities of the MS800, they could have something that would better compete with other options in this price range. 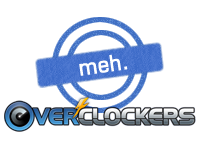 But for now, I feel there are better options to be had at this price point, and therefore, it’ll have to be the “Meh” award this time around. No front intake fan, what were they smoking? meh. cases are getting more and more boring lol. 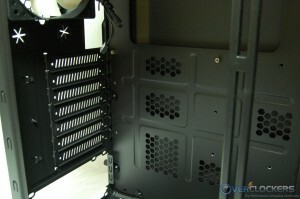 90% of mid towers are all the same exact frame with some plastic clipped on : good review. 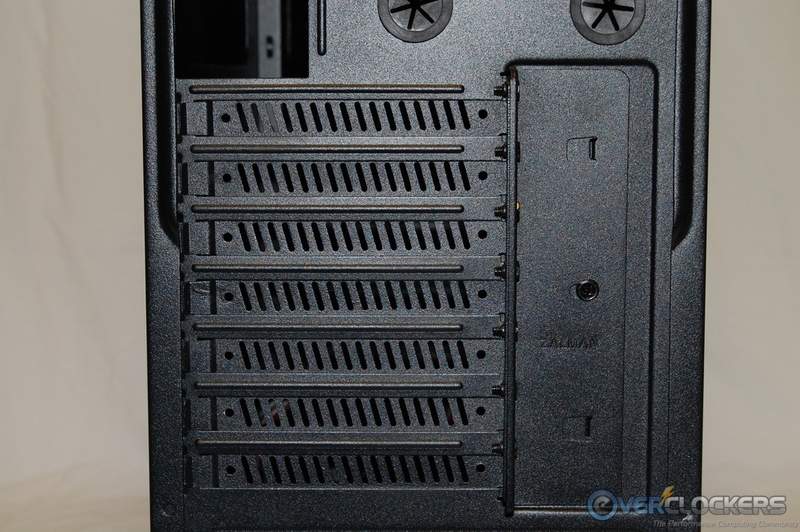 Idk why people care so much about front intakes, it seems like they would all be blocked by the cages for the HDDs, at least, the 200m and 120mm slots on the front of my CM Cosmos II are blocked more than partially by it. 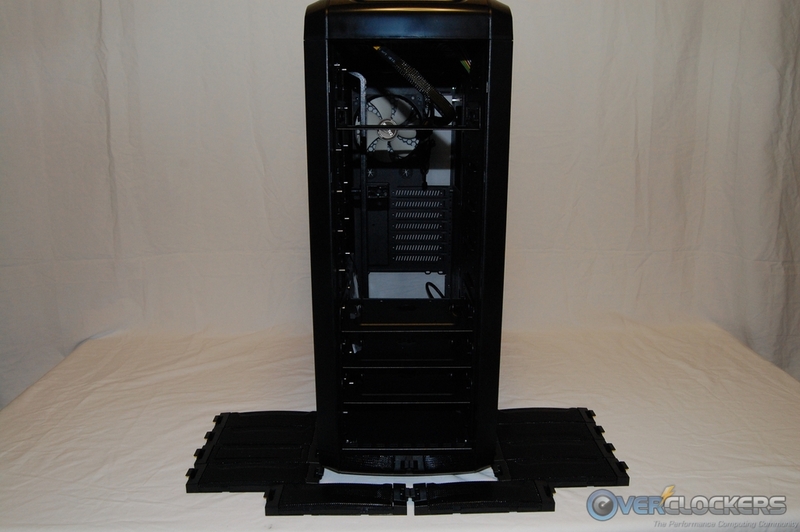 I must say though, Zalman cases are entirely my style, the black and silver minimalist affair and all of that. There are not to many visually loud cases around anymore, not like my old Chimera 2 I thought was cool when I was 14,anyways. I was particularly fancying the GS1000 for my current build. That said, I do like the style of the case and Zalman cases have been awesome in the last couple years, which is why I was so surprised by the overlook. I really like the design of Zalman cases and I am currently using a Zalman Z11 plus. It's just a real shame that they always miss opportunities and make mistakes with the design. 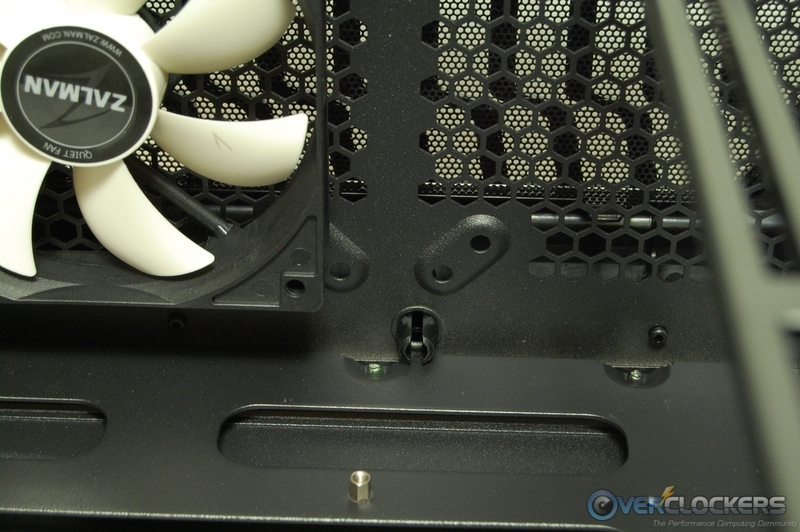 These often seem to be stupid things like not using the correct fan spacing for a dual radiator, or not allowing enough space for a top CPU AUX12V and a top fan (in the Z11).